One of the most common problems durometer users experience is false readings due to pressing too firmly on the gauge and imbedding the foot of the gauge into the test specimen. To make durometers a good instrument for testing in hard to reach areas, we designed our gauges with the smallest foot possible which is 1/2" diameter. This small foot makes it easy for an inexperienced user to imbed the foot of the gauge into the soft specimens thus obtaining false readings. One simple way to prevent this operator error is to install a Big Foot attachment onto the lower barrel of the gauge. 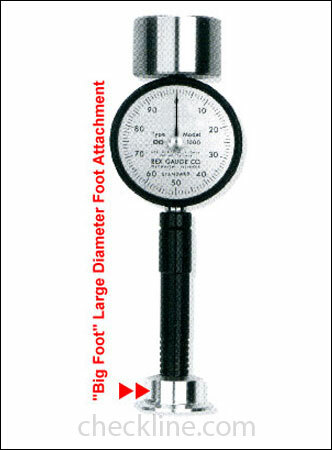 The Big Foot increases the diameter of the foot from 1/2" to 1 3/8" diameter, which makes it nearly impossible for the user to imbed the foot into any test specimen. The Big Foot is an option which can be ordered installed on any new gauge, or ordered separately. It includes a wrench and instructions. **Note: Increasing foot diameter can effect durometer readings.